2017 Chevrolet Cruze LT Auto Sedan $21,240+tx & licensing. Includes $1,000 Employee Lease Cash & $750 Emplyee Connect & Win Bonus. Lease at 0.5% for 48 Months for $113+tx & licensing bi-weekly. $289.92 cost of borrowing. 20,000km per year allowance. $0.16/km overage charges apply. 2017 Chevrolet Cruze LT Auto Hatch $21,790+tx & licensing. 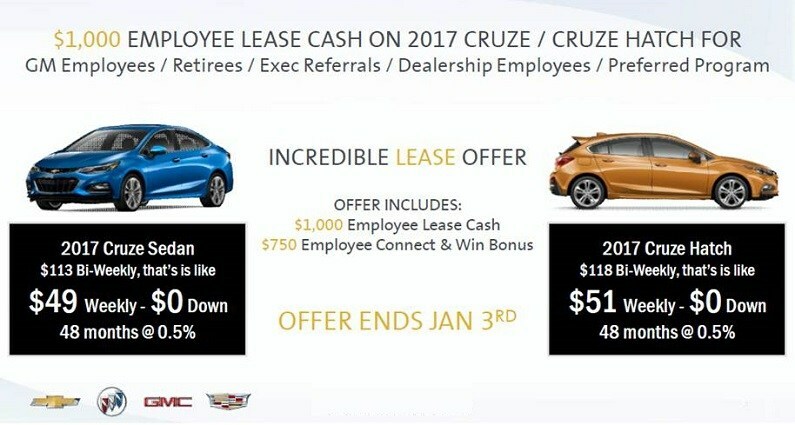 Includes $1,000 Employee Lease Cash & $750 Employee Connect & Win Bonus. Lease at 0.5% for 48 Months for $118+tx & licensing bi-weekly. $295.20 cost of borrowing. 20,000km per year allowance. $0.16/km overage charges apply. Offer ends Jan 3, 2016.